During breeding season (March to September), the dominant male performs a ritualized courtship dance by shaking his wings and tail feathers. If the main hen is impressed, the two will mate. The other hens in the group may also mate with the dominant male or with other lesser males. Then the dominant male scratches out a shallow pit in the dirt to create a nest. The dominant female will lay around 7-10 eggs in the center of the nest, and the other females place their eggs to the outside. The communal nest may have as many as 60 eggs in Both the male and female ostriches take turns incubating the eggs. Each egg is 15 cm (6 in.) long and weighs 1.5 kg (3 lb.). Ostrich eggs are the largest in the world! If the eggs are kept safe from hyenas, jackals, and Egyptian vultures, they hatch after around 6 weeks. The chicks are born about the size of a chicken and grow 30 cm (1 ft.) each month! By six months, the young ostriches have grown nearly as tall as their parents. Although chicks can run as fast as 55 km/h (35 mph) at one month old, they are still fairly vulnerable to predators like, leopards, hunting dogs, and hyenas. When confronted, adults will try to distract predators or lure them away. Chicks are born with a spiky, greyish-brown down. They grow brown feathers after 4 months. Then around 3-4 years, ostriches reach sexual maturity. Males develop a striking black and white plumage while females continue to have a brown plumage. 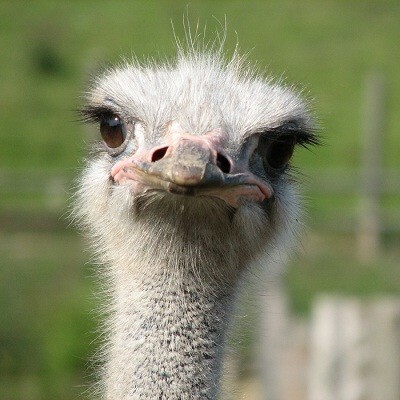 In the wild, ostriches live around 40 years.